Out from behind the bushes pads a beautiful black wolf. Her golden eyes look you over as she sniffs the air catching your scent, deciding you pose no harm to her or the other creatures that inhabit her landscape. As you look around, you see snow for it is winter here on the Hidden Forest. She watches you in haunting silence, then sits down and speaks, "My name is She~Wolf, welcome to my Forest. It is quite a sight. I trust that you leave it in the condition you found it in. If you get hungry or thirsty just follow the line of trees to the south about a mile up. There you will find a tavern called The Keep. I must warn you though. You will find more unusual beings there than just a talking wolf. You may not even make it out alive. I see you feel rather uncomfortable listening to a wolf talk, if you stay here for a second I will be right back"
She moves with an air of grace, awareness, beauty and danger. she always wears rather revealing clothes that sometimes fits to her body like a glove, enhancing her beauty. As she smiles a flash from her silver tipped fangs catch your eye and draw you into her prey. "Now then is this better, are you comfortable now? Hey wait! Why are you leaving? Come back! I wont bite! Well if you must go, follow the tree line... or you can click on the links below to see some of my favorite hang-outs.." She sighs as her guest runs off in quite a hurry, "I lose more people that way". 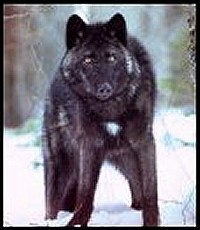 To learn more about me click on the wolf print.